Gravity Filler uses time-based system that loads liquid economically into its container. It might also work with high viscous product, but this liquid filler is mostly appropriate in filling thin liquids or low viscosity product. Gravity filler is designed with a tank above the fill heads. When the container reaches below the fill head, the fill valves will open for a predefined amount of time, which allows the product to flow to its container. Once the time lapses, the fill valve closes and the supply of liquid is cutoff. Overflow filling machine is one of the most sough-after liquid fillers that handle low viscosity products. This type of filler is mostly appropriate for packager who works with filling products into a clear container. As aesthetic value of the product is always concerned, level fill should be at its best presentation when it hit the shelf. Though there would be a little difference into the internal volume of the same type of containers, overflow filler ensures consistency in achieving each bottle a level fill. This filler uses special nozzles that move down into the bottle and seal over the product opening and release product into the container. When the product reaches a certain level in each container, the overflowed liquids will return to the supply tank, leaving every container with a level fill equally to all other containers. Every filling task requires different packaging equipment based on the type of product and production rate requirement. 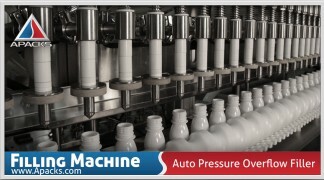 The two machines mentioned above are the two most well-known machines that handle low viscosity products. To find out more about the latest technology in the marketplace, better hit the huge platform of the internet to find reputable liquid filler manufacturers.